Source : "Western Maryland Diesels", Crusader Press, 1979. 25 GP9    DS-24 May-54 EMD   1750 Low nose, dynamic brakes. 26 GP9    DS-24 May-54 EMD   1750 Low nose, dynamic brakes. 28 GP9    DS-24 May-54 EMD   1750 Low nose, dynamic brakes. 29 GP9    DS-24 Feb-55 EMD   1750 Low nose, dynamic brakes. 30 GP9    DS-24 Feb-55 EMD   1750 Low nose, dynamic brakes. 32 GP9    DS-24 Sep-55 EMD   1750 Low nose, dynamic brakes. 33 GP9    DS-24 Apr-55 EMD   1750 Former EMD demonstrator. Low nose, DB's. 34 GP9    DS-25 Jun-56 EMD   1750 Low nose, dynamic brakes. 35 GP9    DS-25 Jun-56 EMD   1750 Low nose, dynamic brakes. 36 GP9    DS-25 Sep-56 EMD   1750 Low nose, dynamic brakes. 37 GP9    DS-25 Sep-56 EMD   1750 Low nose, dynamic brakes. 38 GP9    DS-25 Sep-56 EMD   1750 Low nose, dynamic brakes. 40 GP9    DS-27 Apr-57 EMD   1750 Low nose, dynamic brakes. 41 GP9    DS-27 Jun-57 EMD   1750 Low nose, dynamic brakes. 42 GP9    DS-27 Jun-57 EMD   1750 Low nose, dynamic brakes. 75 44T    DS-6  Jul-43 GE     380 Sold to U.S. Plywood in 1964. 76 44T    DS-6  Aug-43 GE     380 Sold to U.S. Plywood in 1964. 101 VO660  DS-1  Sep-41 BLW   1000 Scrapped/retired between 7/63 & 7/68. 102 S1     DS-2  Jun-41 ALCO  1000 Retired 1962. Converted into slug 138-T.
103 VO660  DS-3  Jul-42 BLW   1000 Scrapped  in July 1963. 104 VO660  DS-3  Jul-42 BLW   1000 Retired in July 1968. 105 VO660  DS-3  Sep-42 BLW   1000 Scrapped/retired between 7/63 & 7/68. 128 VO1000 DS-5  Sep-43 BLW   1000 Retired 1963. 129 VO1000 DS-5  Sep-43 BLW   1000 Retired by 1968. 130 VO1000 DS-5  Nov-43 BLW   1000 Retired by 1968. 131 VO1000 DS-5  Nov-43 BLW   1000 Retired by 1968. 132 VO1000 DS-5  Feb-44 BLW   1000 Retired by 1968. 133 DS44   DS-9  Dec-46 BLW   1000 Retired in 1964. 134 DS44   DS-9  Dec-46 BLW   1000 Retired in 1968. 140 S2     DS-7  Jan-44 ALCO  1000 Retired during late 1960's. 141 S2     DS-7  Jan-44 ALCO  1000 Retired during late 1960's. 142 S2     DS-7  Mar-44 ALCO  1000 Retired during late 1960's. 143 S2     DS-8  Dec-46 ALCO  1000 Retired during late 1960's. 144 S2     DS-8  Dec-46 ALCO  1000 Retired during late 1960's. 145 S4     DS-21 Nov-50 ALCO  1000 Retired in 1968. 146 S4     DS-21 Nov-50 ALCO  1000 Retired in 1968. 170 DRS44  DS-11 Jun-47 BLW   1500 Sold for scrap 1/69. 171 DRS44  DS-14 Jul-48 BLW   1600 Traded to EMD 6/69. 172 DRS44  DS-14 Jul-48 BLW   1600 Traded to EMD 6/69. 173 AS16   DS-20 Jun-51 BLW   1600 Traded to EMD 6/69. 174 AS16   DS-20 Jun-51 BLW   1600 Traded to EMD 6/69. 175 AS16   DS-20 Jun-51 BLW   1600 Traded to EMD 6/69. 176 AS16   DS-20 Jun-51 BLW   1600 Sold for scrap 1/69. 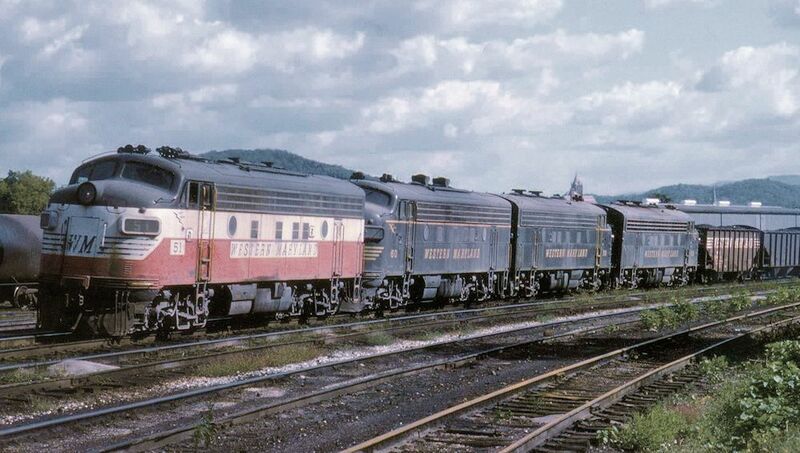 70, 73, 75 - If known, the WM paint scheme the loco wore in that year. B = Black with speed lettering, R = Red / White / Black "Circus Scheme"